The role of bridging finance allows eager property developers to act quickly on an investment opportunity. Rather than wait for traditional funding from a bank or mortgage, a bridging loan allows individuals and companies to borrow up to £25 million for around 12 to 24 months. Instead of waiting from mainstream finance, the application is much quicker and funds can be drawn down in one lump sum within 7 working days of applying. Hence it is used as a metaphorical ‘bridge’ to help the customer reach their goal. Bridging is most commonly used for buy-to-let purposes, both residential and commercial. Investors will try find a property with a lot of potential and use the funding to pay for extensions and refurbishments. Once completed, they can rent out the property to residential tenants or companies looking for office space. At the end of the loan term, the company is in a position to refinance their existing loan under new terms or repay the loan using other forms of investment. Property developers will look for any way possible to add value to the property. This includes adding extra parking, conversions, gardens and double glazed windows. There is a strong argument for adding solar panels for large commercial properties such as multi story office units, factories and warehouses. With prices started from £4,000 + VAT, the savings on energy costs can be enormous when calculated over several years. For instance, adding 16 solar panels at 4,000 kw can lead to a saving of £404 every year and allow companies to break even at the 14-year point. For 40 solar panels at 1,000 kw, the savings per year can equal around £1,000 and take 18 years to break even. This offers investors and property-owners a way to create sustainability, run a cost-effective operation and the ability to sell on the solar panels if they sell the property. 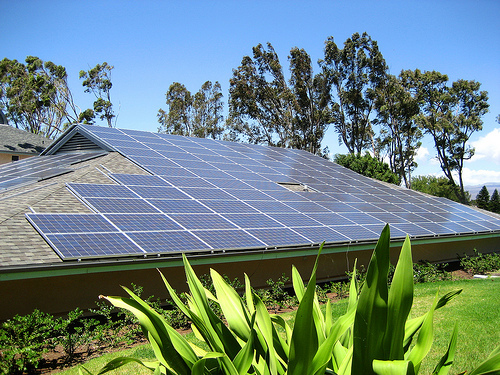 Read more about commercial solar panels.